On Feb. 24, Tsinghua University issued official news that Li Xueqin, director of its Unearthed Research and Protection Center, died of illness at the age of 86. An expert on history, archaeology, philology and palaeography, the encyclopedic scholar, filled with interest, persistence and curiosity, has spent over six decades travelling through ancient history and struggling to track every hidden trace of Chinese civilization. 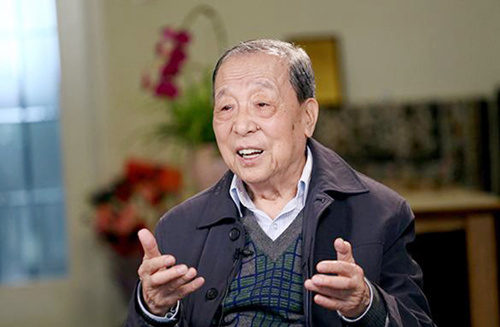 In 1933, Li Xueqin was born into an intellectual family in Beijing. When he was a young man, he had more books than many university professors. In 1951, Li enrolled in the Department of Philosophy at Tsinghua University. After less than two years, he dropped out of school and entered the Institute of Archaeology under the Chinese Academy of Sciences (later under the Chinese Academy of Social Sciences) as a temporary worker. He is among the few people who dropped out of Tsinghua University later became a professor of it. According to Li’s own words describing his academic career, he went to the Institute of Archaeology to process and transcribe the oracle bones unearthed from the Yin Ruins in 1952. At the end of 1953, he moved to the Institute of History, where he worked as an assistant of Hou Wailu, a historian of Chinese philosophy, and participated in the writing of the General History of Chinese Thought. He again engaged in archaeology and palaeography by compiling bamboo and silk manuscripts after the Mawangdui Han Tombs and the Yinqueshan Han Slips were discovered in the 1970s. Li’s research interests seem distant from each other, but in fact they follow a simple thread, namely the early period of Chinese civilization. A popular saying goes in academic circles that Li Xueqin compared himself to a multi-band radio that could be switched from a mid-wave broadcast to a shortwave broadcast with an easy flick. Most people were too far behind to catch up with his knowledge, memory and exceptional ability to switch academic attention among various fields. After years of multidisciplinary studies, Li came to understand that the legacy of traditional Chinese culture was underestimated for multiple reasons. He aimed to pass this understanding on to future generations through objective argumentation and legitimate examination. “Therefore, I proposed re-evaluating ancient Chinese civilization in 1981 in order to contribute to the country’s cultural construction,” Li said. After his participation in compiling A Collection of Yin Ruins Texts in 1952, during his academic career Li published more than 40 books of different kinds. In oracle bone research, he founded the bi-system theory based on his studies of the Yin Ruins, promoted research on oracle inscriptions whose divinatory texts are not about the Shang Dynasty (c. 1600–1100 BCE) or its emperors. Also, Li was the first to identify oracle bones from the Western Zhou Period (c. 1100–771 BCE). Compared with oracle bones research, his studies on the texts from the Warring States Period (475–221 BCE) and on bamboo and silk slips were two newborn disciplines. Li initiated comprehensive research on the texts from the Warring States Period, facilitating the formation of a new branch of Chinese paleography. When it comes to bamboo and silk manuscripts, Li joined or led the compilation work of such precious materials as Mawangdui silk texts, the Han slips found in Ding County, Shuihudi Qin bamboo texts and Tsinghua bamboo slips. He has made tremendous achievementswas by being devoted to such work while keeping an eye on academic history. Li held that Chinese culture had several major historical turning points. These coincided with periods of thriving thought and culture, such as the dynasties of Zhou, Han, Northern Song, Southern Song, Ming and Qing. The period between the late Qing and the Republic of China was also included. In particular, the Zhou and Han dynasties were of great significance, which covered the time span from the late years of the Spring and Autumn Period (770–476 BCE) to the Warring States Period and extended to the early years of the Western Han Dynasty (206 BCE–8 CE). “Traditional Chinese culture laid the groundwork during this period and welcomed its first golden age. Many of the classics took shape in this process,” Li said. Tsinghua bamboo slips were discovered from a mid-to-late Warring States Period tomb in the region of China culturally dominated at that time by the Chu state. The artifacts could provide clues as to how these classics came into being. Thus, in the last decade of his academic career, Li spent his largest efforts in this field. There is a small workplace on the third floor of the Tsinghua University library. It has witnessed countless days of Li’s hard work. During the last decade, the Tsinghua bamboo slips team published one compilation report each year. Every time the team assigned work, Li always got the hardest part, but he was the first one to finish it well and fast. Li never stopped writing papers despite his struggle with disease in the past year. He published two articles in journals just over a month ago. “Slow down, you can take it slow,” said then vice president of Tsinghua University Xie Weihe. Xie really cared about Li, who was considered a treasure of the university, and suggested many times that he relax more. However, Li always felt an urgent call to his studies because of his great respect for history and his responsibility as a historian. Li believed that the significance of a major archaeological find is not the discovery of wares made of gold, silver or jade, but its role in shifting our previous historic or cultural understanding of a period, a nation or a region. “I think this perspective explains why Tsinghua bamboo slips matter a lot,” Li said. Li was the director and chief scientist of the national project for the study of early Chinese civilization known as the Xia Shang Zhou Chronology Project. The project started in 1996 based on the results of Chronological Study of Western Zhou Bronzeware. Combining this with Li’s studies on calendars, the project team completed Calendar of Western Zhou Bronze Inscriptions, which could aid exploration of that time through the lens of bronze inscriptions. Apart from academic efforts, Li also stressed the cultivation of young students’ attitudes toward history. “When I entered university, this 70-year-old teacher held an instructive course for a whole year. Each class, he invited renowned Chinese scholars in the fields of literature, history and philosophy. He was never absent from any class. He never lowered his teaching quality with the excuses that we were only freshmen or he was too busy to prepare. This was the morality and refinement of a master,” a Tsinghua University graduate, on hearing Li’s passing, posted this on his WeChat Moments, a Chinese Twitter-like platform. A pure and modest life is self-satisfying. A few years ago, Li suggested establishing a research center for oral history that would “visit elderly scholars and record the things they wanted to do most but were yet to be done.” For Li, what would be his answer? Among the many comments, someone posted that “he hasn’t seen the new building of the Unearthed Research and Protection Center of Tsinghua University.” Others felt sorry for him that the protection and research of Tsinghua bamboo slips was still at a halfway point. For Li, however, he may have just laughed without saying anything. This article was translated from People’s Daily.